Thanksgiving is the time to gather with family and stuff your face with delicious food to your heart’s content. With the American demographic becoming more and more diverse, some Chinese-Americans celebrate this iconic holiday with traditional Chinese cuisine. Even though the food may differ, the sentiment of giving thanks to loved ones remains the same. Hot Pot, eaten during the cold months, is a common cooking method introduced to East Asia millenniums ago by the Mongolian Empire. There are many variations of Hot Pot found in households in China and the United States. It is prepared with a simmering pot of soup stock (can be homemade or store-bought) and many East Asian foodstuffs and ingredients. While the stock is simmering, ingredients are placed into the pot and cooked at the table. 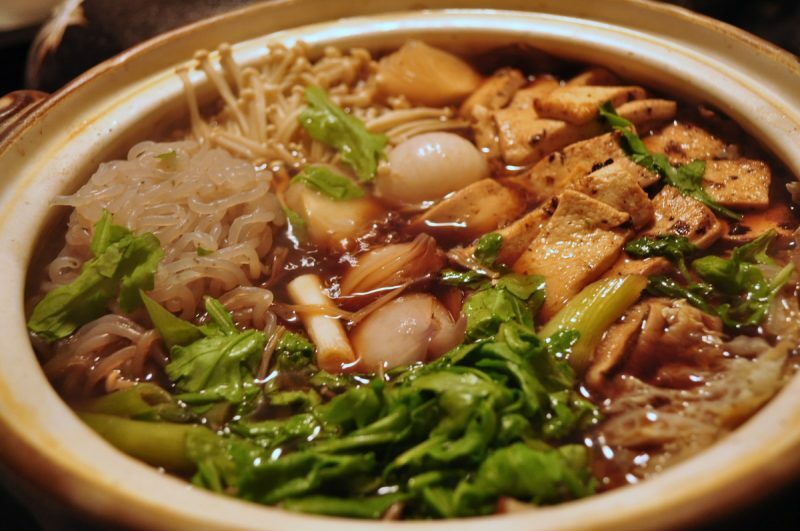 Hot Pot dishes include thinly sliced meat, leafy vegetables, mushrooms, dumplings, tofu and seafood. After cooking the ingredients in the stock, you can then eat this dish with a dipping sauce. My personal one includes sesame oil, soy sauce, seafood sauce, oyster sauce, scallions, ginger and chili paste. This savory sauce serves as the perfect compliment to the lightly flavored Hot Pot ingredients. The cooking base can vary, but my family uses chicken stock with green onions. After several torturous minutes waiting for the stock to simmer, I toss in sliced beef and fish cakes to cook. Make sure you thoroughly cook your chicken and pork in the Hot Pot before serving. After a couple minutes of simmering, the ingredients should be ready to be served with some delicious homemade sauce. The spice level of Hot Pot can vary, ranging from a spicy Sichuan style to a more mild dish. Hot Pot can also be made using a Pressure Cooker or an Instant Pot, and this method can save time. If you have never made this dish before, check out a beginner’s recipe to start. Try this iconic Chinese celebratory tradition this Thanksgiving.